Heather and I braved the rain and went out to the second Dallas Area Blogshoot today. 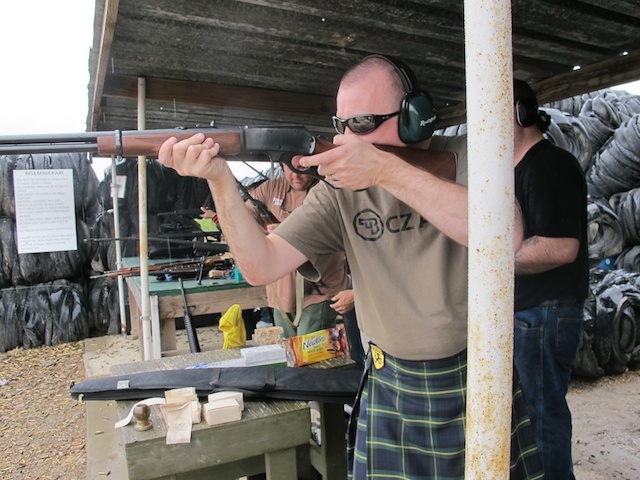 The Jeep was packed full of firearms and ammo, as well as a couple prizes for Kilted To Kick Cancer fundraising. We had a great time shooting, talking, and teaching a few new shooters how to shoot safely. Thanks to The Redneck Engineer and Bob S. for putting it together, as well as to everyone who came out. You all are a great bunch of people and we’re honored to know you all. And yes, I was kilted today, and did raise some more money thanks to some really generous people. If you haven’t donated, please head over here and throw some money in the pot. It’s a good cause and your help would be greatly appreciated! This entry was posted in Kilts, Shooting by Pat. Bookmark the permalink. We were happy to help out with KTKC. Thanks for stepping up and talking about it. It was a pleasure to see you again and to meet Heather. I hope you folks had a good time. Even with the rain I think it went well. That picture must have been early in the shoot; I can still see the table in spots and I know later on there was no room for another gun on the tables. It was great to have you and your wife out. The whole thing went really well, and we do appreciate you and your wife’s contributions and presence. Thanks for your support of the D.A.B. 2.0, and Kilted to Kick Cancer. I didn’t envy you in that kilt with the rain and cold weather, but you’re a heck of a trooper. Everything was awesome, and I can’t wait to go shooting with you both again.